Ba Zhen Wan is the single most important formula for supporting and nourishing women who are blood deficient. Si Jun Zi Tang (Four Gentleman) strengthens digestion. Dang Shen (codonopsis root), Bai Zhu (atractylodes rhizome), Fu Ling (poria cocos fungus), and Gan Cao (licorice root) improve digestive function, dry dampness and boost energy. Four gentlemen also elevates the immune system. Blood is manufactured by the body from the nutrients provided by the food that we eat. When our digestion is good, the body produces healthy blood which nourishes all the cells in our system. Si Wu Tang Wan (Four Substances) nourishes blood, helps regulate the menses, and prevents blood stagnation. Dang Gui (angelica sinuses root) nourishes and regulates the blood. It is important in assisting women both with hormones and with blood. Shu Di Huang (prepared rehmannia root) nourishes blood to eliminate anemia. It also helps replenish yin body fluids which include hormones. 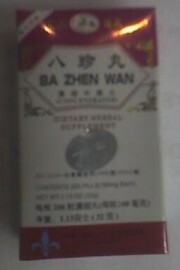 Bai Shao (white peony root) nourishes blood, stops pain, cramps and spasms. It helps to eliminate cramps by promoting the production of more blood and by helping the body to retain vital fluids which lubricate the muscles, tendons and bones. Bai Shao is also an important herb to help normalize the liver functions which controls blood flow during the menstrual cycle. Chuan Xiong (ligusticum root) regulates blood, and helps stop pain, cramps and headache. It is a very important gynecological herb.